Historical Tapestry: Michelle Moran Guest Post - Why Cleopatra's Daughter? 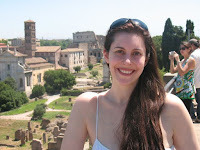 Michelle Moran Guest Post - Why Cleopatra's Daughter? One of the most frequent questions I’m asked by readers is what life was like two thousand years ago when Julius Caesar walked the corridors of the Senate house and Cleopatra visited Rome. Surprisingly, life for the ancient Romans was not unbelievably different from today. The Romans had many of the little luxuries that we often associate exclusively with the modern world. For example, baths were to be found in every city, and public toilets were viewed as a necessity. The toilets depicted in HBO’s Rome Series are copies of those discovered in Pompeii, where those caught short could find a long stretch of latrines (much like a long bench with different sized holes) and relieve themselves next to their neighbor. Shops sold a variety of wigs, and women could buy irons to put curls their hair. For the rain, there were umbrellas, and for the sun, parasols. Houses for the wealthy were equipped with running water and were often decorated quite lavishly, with elaborate mosaics, painted ceilings, and plush carpets. What a great post Michelle. I found it very interesting how you got your inspiration for the subject of this book. You certainly did have an adventure. I eagerly look forward to reading your book. I, too, love hearing the inspiration for your story. I didn't even know Cleopatra's city is now under water. How cool to visit it! I love how you took an unknown historical figure and bring her to life. I am looking forward to reading your books! Michelle has the best Guest posts! And we also have Michelle at The Burton Review with the giveaways of her two latest books, both signed, both contests open worldwide. Wow Michelle, what an adventure! I had no ideas they had running water. So many culture after that didn't seem to have that luxury. During our trip to Egypt, we made it to Cairo, Luxor, and Aswan but failed to make it to Alexandria. Darn...guess we'll have to go back :) I'm dying to do that dive and see the new Library. I too thought her children were killed so I was so surprised and happy when this book came out and I found out they weren't. Thanks!